Following a long period of conflict and mistrust, including the treacherous murder of Piet Retief and his companions at the hands of the Zulu chief Dingaan, the Voortrekkers, led by Andries Pretorius, prepared for battle against the Zulu kingdom on the banks of the Ncome River on 16 December 1838. The 460 Voortrekkers formed an impenetrable laager, a defensive camp encircled with their ox-wagons, and fought the 15,000-strong impi attack until the Zulus finally retreated, leaving thousands dead and the river red with blood. The violent encounter became known as the Battle of Blood River. About 3,000 Zulu warriors are thought to have died in the battle but the Voortrekkers sustained only injuries. 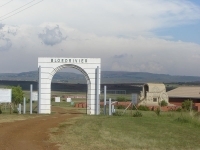 The Blood River/Ncome Heritage Site commemorates this significant battle with monuments and museums to both the Voortrekkers and the Zulus on both sides of the river. This gives the visitor a more complete perspective of events. On the east side is the Ncome Monument and Museum Complex, dedicated to the fallen Zulu warriors, while the Blood River Monument and Museum is located on the west bank and features a life-size replica of the Boer wagon laager. The Ncome Museum building was designed in the shape of buffalo horns, recalling the battle formation in which the Zulu army attacked. It is definitely advisable to visit both museums.